The Ministry of Health yesterday put through the clinical trial test of combined measles-rubella vaccine made by the Ministry’s Center for Research and Production of Vaccines and Biology (POLYVAC). Measles-rubella vaccine is the first one which is produced under the transferred technology under Japan International Cooperation Agency (JICA)-funded project ““Strengthening Capacity for Measles-Rubella Combined Vaccine Production”. POLYVAC has been running the project since May 2013 at the total cost of JPY700 million. With technical support from Japanese experts and concerted effort of the POLYVAC staff, the vaccine was first submitted for clinical trial testing and was assessed to be safe and effective for human use. 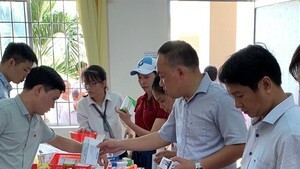 With the success in making the vaccine, Vietnam is one of the twenty-five vaccine producing countries in the world and the fourth Asian country to manufacture the MR vaccine, following Japan, India, and China.